You may have heard the standard drill of when to head into the hospital for signs of labor, but what about before? Do you know the signs and symptoms of what you need to be seen for during pregnancy? I'm going out on a limb here, but I would estimate that approximately half (and honestly, probably even more) of the women that come into the hospital to be seen during their pregnancies probably didn't even need to be there. "Pregnancy symptoms can be confusing... especially for first-time moms." And yet, after every false alarm or every test checked out with no real for concern, you will never see a labor and delivery nurse admonish a patient or tell them not to be so quick to come in. Because as every OB nurse knows, for every 10 patients who come in and are sent home, there is one who really needed to be there. When in doubt, head in — that's our motto. Pregnancy symptoms can be confusing and especially for first-time moms, it can be difficult to discern if a symptom is "normal" or if it warrants further investigation. 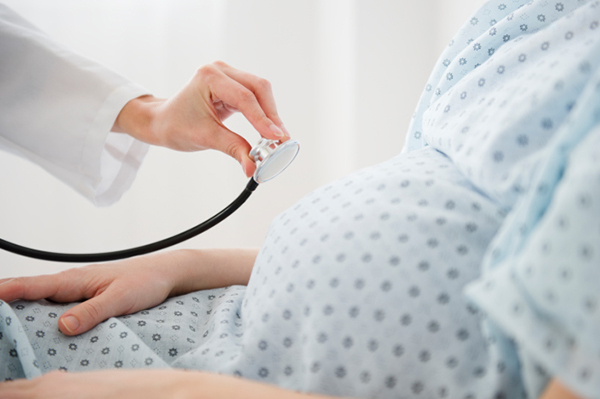 What are some instances during pregnancy that mean you need to pay a visit to your local labor and delivery ward? Any heavy bleeding during pregnancy, and especially during your second and third trimesters, needs to be checked out right away. It could be a sign of a very serious condition called placental abruption, in which the placenta can tear away from the uterine wall. An abruption causes severe pain and heavy bleeding, so you would definitely know that something was seriously wrong. Smaller instances of bleeding that are unaccompanied by pain may have a less serious cause and you could simply give your pregnancy provider a call to see if he or she would like you to come in to be seen. I will admit that even as a nurse, I was horrible with doing those "kick counts" or anything along those lines; it's not always easy to remember or keep track of. But I do believe that as mothers, we subconsciously keep track of our baby's movements inside of us. We come to recognize our little one's pattern for moving and grooving. Some mothers have an active nighttime baby, others know the baby will also start flipping after their morning smoothie. Bottom line: If you suspect that your baby isn't moving as much as he or she normally does or especially if you aren't feeling any movement at all, get yourself to the hospital. It's rare, but I have seen a mother lose a baby only a few weeks before delivery and the lack of movement was the only sign that something was wrong. Is that normal pregnancy discharge or your water leaking? Could it be — gasp — that you actually peed your pants? It can be hard to tell, but all three are real possibilities that labor and delivery nurses see every day. But because it can be so hard to discern the difference (although I will issue this warning — women can get a lot of increased discharge, especially in the last few weeks of pregnancy), it's important to get checked out if you aren't near your due date yet and suspect you may be leaking. I've seen more women than I can count who came in hesitantly, afraid that they may have just leaked urine, who ended up with their water breaking months before their actual due dates. It happens. This one can be a toughie, because Braxton-Hicks can happen all of the way through the third trimester and tend to intensify with each pregnancy. I contracted consistently from 27 weeks on with my third baby and if I had rushed in to the hospital with every one, I certainly would have felt foolish. However, if you aren't sure if your contractions are Braxton-Hicks and they meet the following criteria, it's probably best to be evaluated: They are occurring before you're 37 weeks, they are regular and occurring every 2 to 3 minutes and they increase in intensity when you stand up or walk. Regular, painful contractions before your due date could be a sign of premature labor or they can serve to "wear out" your baby before she's ready to make her arrival. I end with this one, because I do feel like it's one of the most important things that we can do as mothers; we need to learn to trust our intuition. When a mother comes in to the hospital or when a mother is in labor and utters these words: "I don't know what it is, but something just isn't right," you had better believe I pay attention. Mothers know when something isn't right and even if you can't put your finger on it, trust yourself, your body and your baby. You are your own best health advocate.